January 2010 ~ I Can Do That! Making this saltless bread was not the real challenge, but looking for ways to enjoy the bread or the reasons to justify its existence was. I actually liked its natural sweet flavor but after eating 2 slices plain, I was craving for something savory to eat it with. 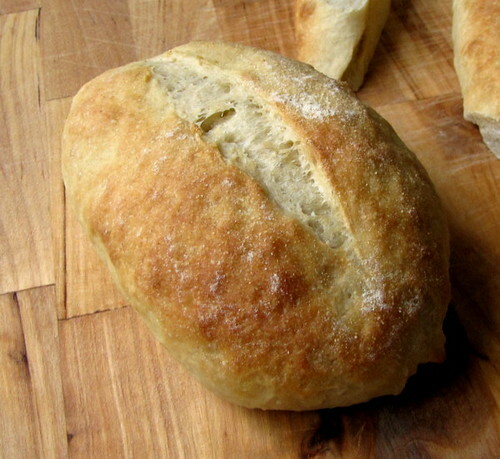 According to Peter this bread should be eaten with rich flavorful meats and soups. 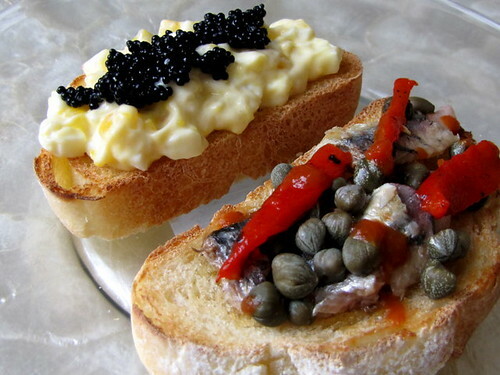 After rubbing the slices with garlic, I drizzled some olive oil, then topped it with spicy Portuguese sardines, strips of roasted sweet pepper, capers, flaked sea salt, and a few drops of sriracha sauce. It was delicious, but then the same toppings tasted way better on salted bread. Sorry but Tuscan bread just can't win. The wonderful texture and ease of preparation aren't good enough reasons to make this again. Mongolian Barbecue was all the rage in the Philippines in the mid-1980s. We used to eat it regularly in fast food restaurants that serve them. What's not to like: meats or seafood mixed with lots of vegetables and flavored with highly seasoned sweet sauce. We never had it again when we moved here in the US and I have forgotten about it. About 5 years ago, Mongolian Barbecue restaurants started sprouting in the Washington D.C. area and one opened in my town only to close after 2 years. I guess people here don't like the idea of mixing everything like chop suey. Mongolian BBQ is of course best eaten with a bowl of steaming hot rice and what could be better than mixing them all together and make it into Mongolian Barbecue Fried Rice. Combine all the ingredients in a saucepan. Heat until boiling, reduce heat to medium and continue boiling, partially covered, until reduced by half. Remove star anise and green onion and discard. Transfer sauce into a small bowl. Set aside. Heat 1 teaspoon oil in a wok. Add green onion and egg and stir cook until set but still slightly runny, transfer into a plate and set aside. Heat the remaining oil, add the onion and saute until soft. Add the meat and prawns, stir fry until they change color. Stir in the carrots, green pepper, and cabbage and cook for 2 minutes. Stir in the cooked egg. Add the rice, pour in enough sauce to coat the rice evenly, about 6 tablespoons, and mix well. Taste and add more sauce if necessary. Stir fry for 1 minute. Gently stir in the mung bean sprouts. Serve immediately in individual bowls with extra sauce on the side. Wow, I love this bread. I was prepared for a disappointment but reading through the ingredients I knew this would be a yummier rye bread because of the spices and orange flavoring. These are the ground spices that made me fall for it: aniseed, fennel, and cardamom. 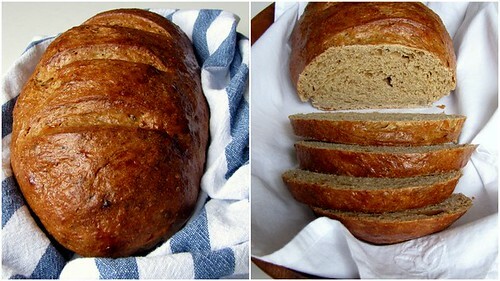 These spices combined with dried orange peels*, brown sugar, and a small amount of molasses make this fragrant sweetish loaf so good just by itself, with butter, or with mild cheeses such as brie or young Gouda. 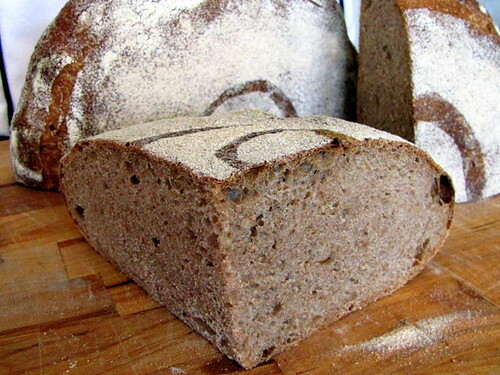 The crumb and crust are soft with a bit of chew and the flavors complement each other, not one flavor is dominant. I think I'm beginning to really love rye breads but will probably take a long time or maybe never to appreciate the 100% Sourdough Rye Bread (BBAC #32). 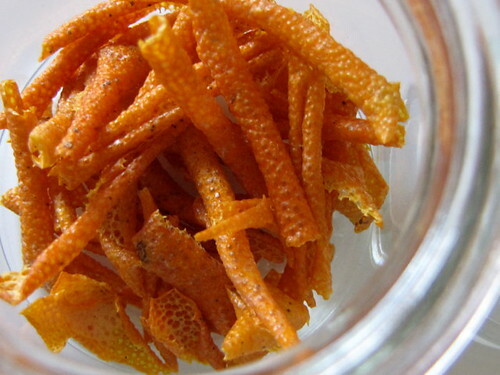 * I usually get dried orange peels [for Chinese-style meat stews] from the Asian grocery store. About a month or so ago I dried some orange peels from 4 large oranges by leaving them on the kitchen counter for 3 days. Then to make sure they are super crispy I put them in the very low heat dry setting of the toaster/convection oven for 20 minutes and stored them in an airtight jar. I pulverized the peels in a coffee grinder for the limpa. Champorado, a Filipino breakfast food, is a sweet chocolate sticky rice porridge. The rice is boiled in water with cocoa powder and sugar, then served with milk just like cereals. After a day in the refrigerator the leftover champorado becomes thick and pudding-like but still very yummy. The photo is ancient, taken in 2006. I chose this photo from my "chocolate" archives because it's perfect for this edition of LaPis: Chocolate. I made 2 separate champorado, one with dark and another with white chocolate, and served them both in one bowl. There is no need to add milk to enjoy this all-time Filipino favorite and you get to savor two kinds of chocolate all at once in one spoonful. Lasang Pinoy Sundays is a gallery of food photography, Filipino style, is hosted by SpiCes and FeistyCook. Bottles of cheap, at $1.50, Spanish sparkling apple cider with very low alcohol content, are all over the grocery stores in my area. I got one bottle not to drink but to cook with it. I've seen sidra featured in José Andrés's PBS cooking show and the unusual way of pouring or "throwing" the cider is quite interesting. The server holds the bottle high over his head with his arm at full extension and pours a small amount straight over his shoulder into a glass that he holds in his other fully extended arm below (see video). The reason for this is to aerate the cider to enhance the aroma and to get the best flavor out of the drink which should be consumed immediately. I tried a little of the cider, poured it about 3 feet above the glass and still spilled some of the cider. It's slightly acidic and sweet with just a little bit of apple flavor; it's similar to a very light fruity beer without the bitterness. I like it a lot. And finished a little less than half of the [700ml] bottle with my lunch of homemade chorizo patties stewed in it. So I bought some more of the stuff to drink and maybe for stewing Forelle pears. Prick the sausages all over with the tines of a fork. Heat the oil in a 2-inch deep skillet large enough to hold all the sausages in one layer. Brown the sausages. Drain all of the fat. Add enough cider to come halfway up the chorizos and bring to a boil. Add the bay leaf, reduce heat to low, cover, and simmer until all the liquid has evaporated, turning the chorizos several times for even cooking, about 20 minutes. 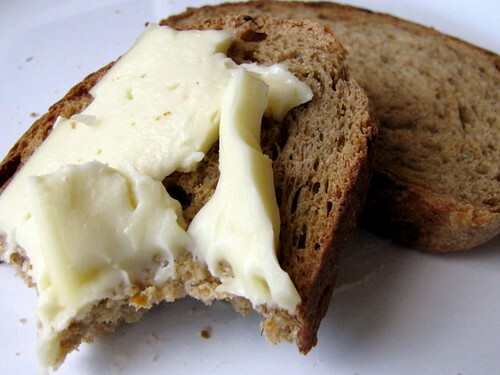 Slice into 2-inch pieces and serve with country bread. 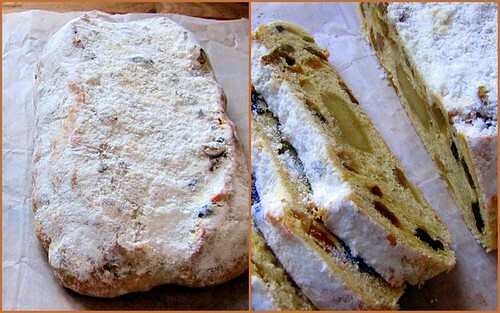 The Bread Baker's Apprentice Challenge #36: Stollen. 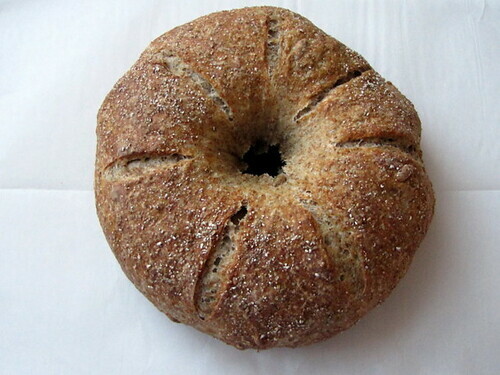 This bread (or is it cake?) has been one of our Christmas treats for the past 20 years. I do not bake them, we buy the German-made loaves which appear at the grocery stores around November up until the first week of January. They are not expensive so I never bother to make them myself until this challenge. There were two things I didn't follow in the recipe. 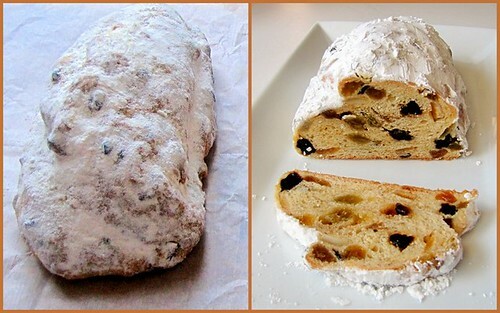 One, I omitted the cinnamon powder because I have never eaten stollen with cinnamon flavor. I love cinnamon but not in stollen. Second, I shaped them using different methods. Immediately after baking, the loaves were brushed generously with melted butter, sprinkled with a little granulated sugar, then covered with vanilla-infused powdered sugar. I wrapped the loaves in plastic film then placed them in the pantry. After 5 days they were ready to eat and the slices were moist and delicious. I love it. Palitaw is a Filipino glutinous rice cake similar to mochi, the difference is the method of cooking. The pieces of palitaw dough are boiled in water until they rise to the surface. LITAW is the Philippine word for surface, hence palitaw. The photo of palitaw in the Filipino guidebook KULINARYA caught my eye because they don't look like the palitaw I grew up eating. The cooked palitaw are stretched into long and thin ribbons before rolling in a mixture of sugar, chopped roasted peanuts, and toasted sesame seeds. I have never eaten palitaw shaped into ribbons and with this combination before which is interesting and also yummy but I still prefer my palitaw dredged in grated coconut, sugar, and toasted sesame seeds. Place the rice flour in a medium bowl then slowly add the warm water. Stir to combine thoroughly. Roll about 2 tablespoons of dough into 1-inch balls and using the palms of your hands, flatten each ball until ½-inch thick. With your thumb make a dent by pressing the center of each cake. Arrange flattened cakes side by side on a baking tray. Fill a medium pan with water and bring to a boil. Drop the cakes in, one at a time, in batches. When they rise to the surface, the palitaw is cooked. Transfer them to a large bowl of water to prevent them from sticking together. Just before serving, take each cake and stretch into ribbon-like pieces. Dredge in sugar-sesame seeds-peanut mixture (or coconut-sugar-sesame seeds mixture). Coil the pieces and arrange on a platter. Sprinkle with grated coconut. 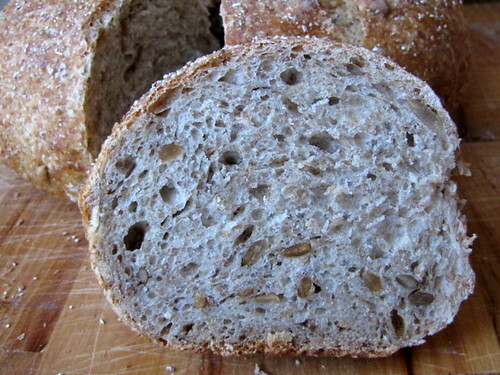 The Bread Baker's Apprentice Challenge #33: Poilâne-style Miche. This bread is supposed to be very large at more than 4 pounds. I didn't think I would be able to handle that much dough and it will also take forever to eat it so I halved the recipe. The procedure is not very complicated. 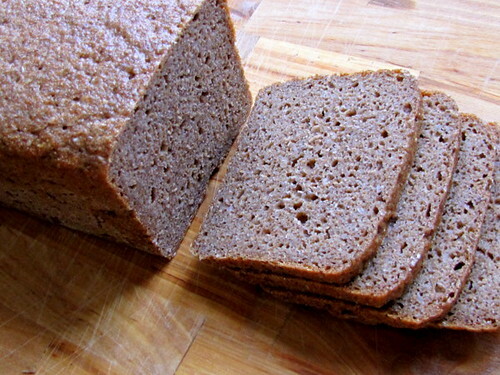 The dough has whole wheat flour (sifted) and doesn't use commercial yeast. I actually used half sifted and half finely ground organic whole wheat flour. For the final rise I put the dough on a linen-lined 10-inch skillet. 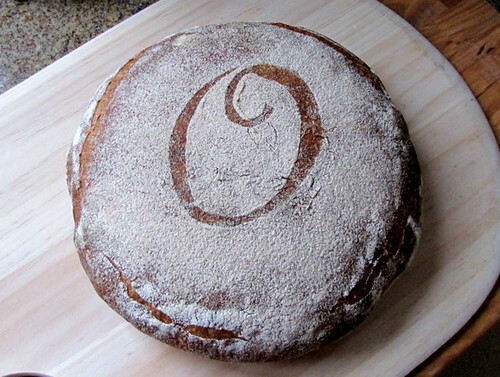 I was not brave enough to score my initial on the top thinking I might ruin it so I stenciled the O which in my opinion is way too small for the size of the bread (12 inches wide and 3 inches tall). The bread came out perfect. 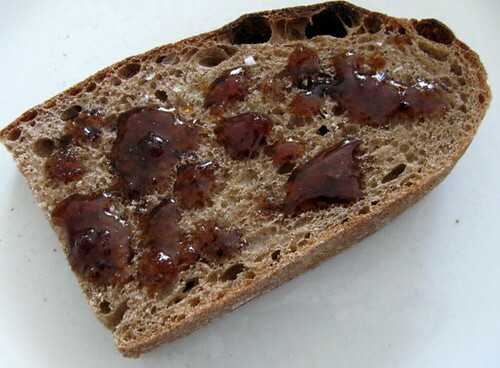 It's dense and chewy, slightly sour and nutty, and moist which surprised me. 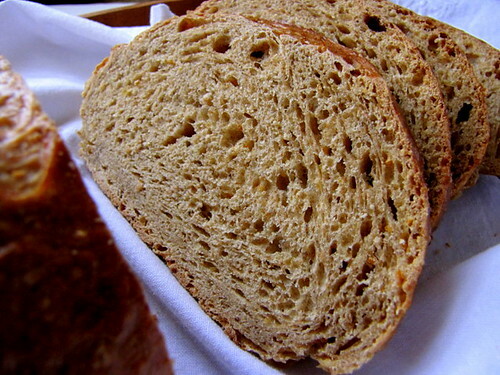 The best thing about this bread is it got better and more sour as it aged, so yummy on the third day. I haven't tasted the original pain Poilâne and have no idea if the flavor and texture of this bread come close to the real thing but I am happy with it and I think it is a keeper. The Bread Baker's Apprentice Challenge has gone awrye. Recipes #32, 34, and 35 for sourdough rye breads use either 100% or part sourdough starters and I think it's appropriate to put them together in one post. 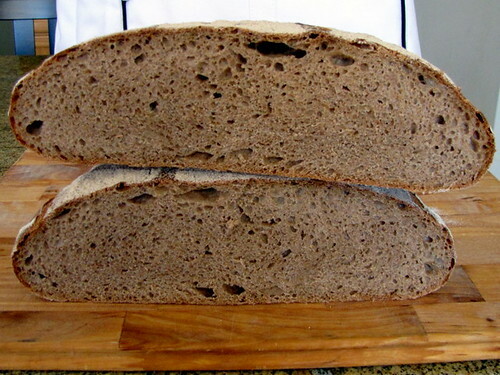 I halved all three recipes and because I was being Miss Contrary I did not follow the book's shaping of the doughs: I baked the 100% Sourdough Rye in a loaf pan; I scored the top of the Pumpernickel loaf, and instead of pressing the crown with a dowel I scored the dough with a wheel spoke pattern. Why? Because I can. #32: 100% Sourdough Rye. How do I describe this recipe without using some colorful words? Hmm. This bread doesn't taste very good and all the work and ingredients I put into making this brick went straight into the trash. I don't mind the dense texture which I think is good but the lack of flavor is puzzling. I absolutely hate it. Maybe I did something wrong along. Well, no use cryeing over it. 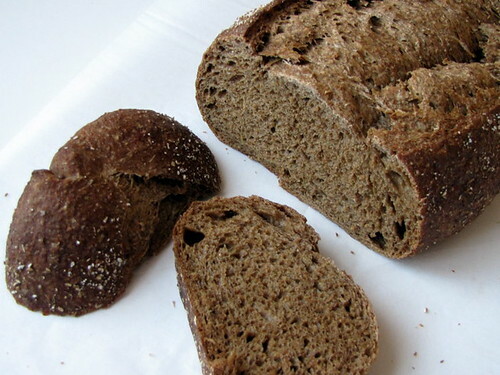 #34: Pumpernickel Bread I used high gluten flour but did not add rye bread crumbs and caraway seeds. However, I used 100% rye sourdough starter instead of the white starter. I love this one maybe because it has brown sugar which makes it a bit sweet and because it is not very sour. It also has a molasses-like and chocolaty flavor, I don't know why because I didn't add cocoa powder in the dough, I used caramel powder. 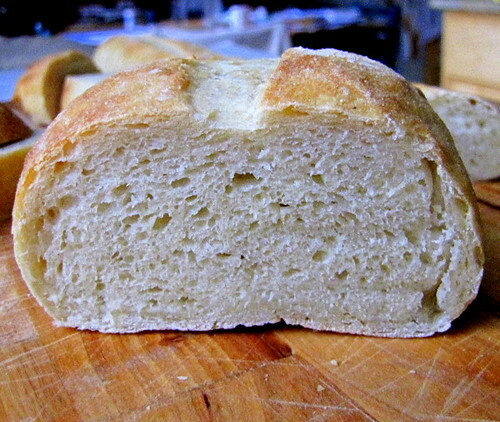 The crust is a tad chewy and the crumb is soft but chewy, very nice with chicken noodle soup. I will definitely make this again. #35: Sunflower Seed Rye The 7½-inch bread is a bit taller than the ones pictured in the book. I should probably have flattened the dough some more. Also, the hole of the crown almost disappeared making it look like a giant bagel. It is a little bit tangier and very tasty too, the seeds add a nice nutty flavor. I also like its chewy crust and crumb. 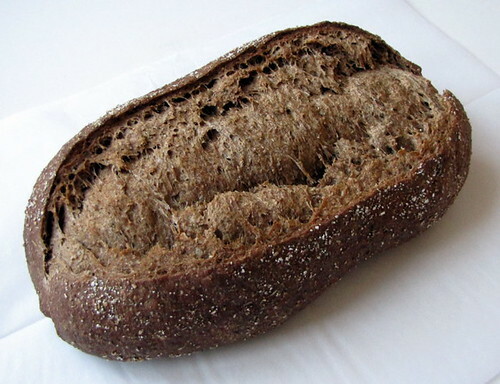 Note: Recipe #33 Poilâne-style Miche will have its own post. It's good to start the new year with sweet sweet stuff and what could be better than salted honey caramels loaded with nuts or enrobed in dark chocolate. The soft chewy silky buttery caramels are so yummy and utterly addicting. I thought of dipping them in melted chocolate, saw this cookie and caramel candy, baked a few crunchy brown sugar meringue cookies, melted some dark bitter chocolate and had the most delicious chocolate treat ever! Line the bottom and sides of a 9-inch square pan with aluminum foil and grease the foil. If using walnuts, spread them in the prepared pan. Combine the syrup, honey, sugar, and salt in a heavy 3-quart saucepan. Cook over medium heat, stirring with a silicone spatula, until the mixture simmers around the edges. Cover and cook for 3 minutes. Uncover the pan, attach a candy thermometer to the saucepan, and cook uncovered, without stirring until the mixture reaches 305°F. Meanwhile, heat the cream in a small saucepan until tiny bubbles form around the edges of the pan. Turn off heat and cover the pan to keep the cream hot. When the mixture is at 305°F, turn off the heat and stir in the butter chunks. Gradually stir in the hot cream; it will bubble up and steam dramatically. Turn the heat back on until the mixture boils. Stir until smooth. Continue to cook, stirring occasionally, to about 245°F. Then cook, stirring constantly to 248°F for soft chewy caramels or 250°F for firmer chewy caramels. Remove the pan from the heat and stir in the vanilla. Pour the caramel into the lined pan. Let stand for 4 to 5 hours or overnight until firm. Lift the pan liner from the pan and invert the sheet of caramel onto a sheet of parchment paper. Peel off the liner and turn the caramel right side up. Cut the caramel into desired size. Wrap individually in wax paper or cellophane.